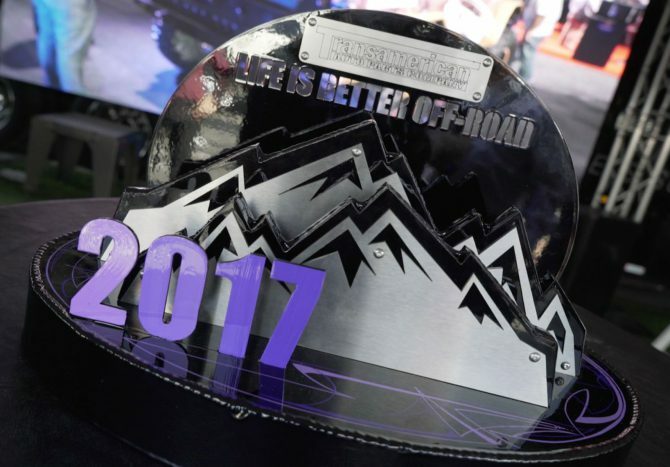 Compton, California (November 2, 2017) – Today, Transamerican Auto Parts named the winner of the third-annual “Life is Better Off-Road™” SEMA vehicle competition at the 2017 SEMA automotive aftermarket industry trade show in Las Vegas, Nevada. 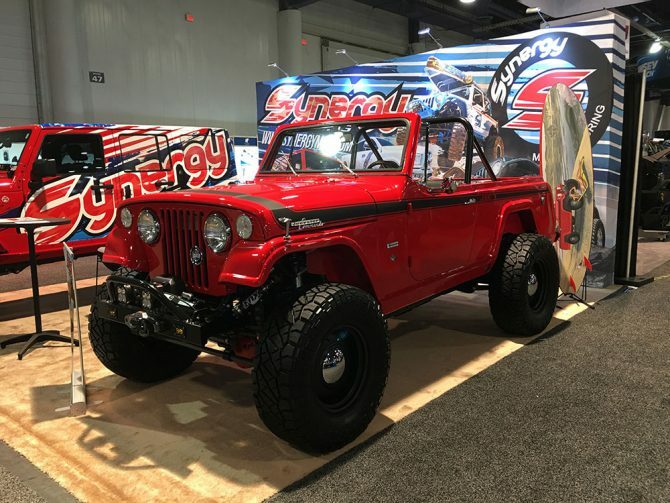 This year’s best presented, truly off-road capable truck, Jeep or SUV on display at the show as deemed by an elite panel of off-road industry experts, is the Synergy Manufacturing’s 1971 Jeepster Commando built on a 2017 Jeep JK Unlimited chassis. The ceremony, held at the Pro Comp/Transamerican Auto Parts SEMA Show booth, revealing the winning entry was hosted by World Famous KROQ DJ Jay “Lightning” Tilles alongside the panel of judges featuring some of the most distinguished names in off-road vehicle engineering and development, fabrication, journalism and motorsports. According to Dave Schlossberg of Synergy Manufacturing, his team wanted to create a stock looking Jeep that remained one-hundred percent functional as an off-roader while bringing out the exquisiteness of vintage Jeep Iron. To achieve this, the team began with a 1971 Jeepster Commando that had seen better days and mated it to a brand-new Jeep JKU Chassis. With nearly 50 years separating these two Jeeps, Dave set out to keep the stock appearance and the Jeepster’s 101” wheel base while completely modifying the frame and suspension. The select panel of judges featured off-road icons and personalities off-road champion and vehicle builder, Casey Currie, DIY fabricator and racer Bill Caswell, fabricator and vehicle builder, Rob “Tinbender” Park, celebrated Trophy Truck developer and builder Jeff Geiser, Content Director for the Truck Trend Network Sean P. Holman and Editor and Publisher for 4 Wheel Parts’ Off-Road Adventures magazine Craig Perronne. 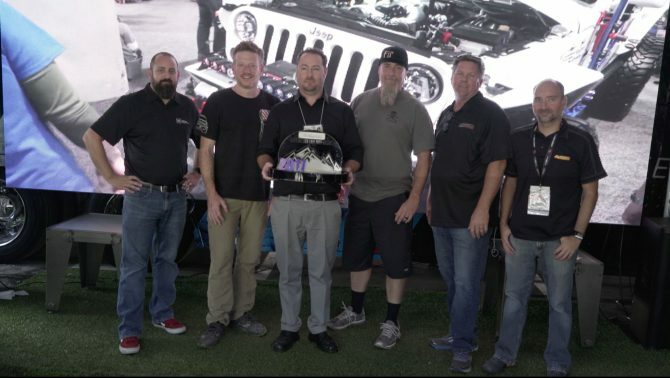 Entries were submitted up until just days before the SEMA Show began and semi-finalists were selected based on criteria such as off-road reliability and capability, quality of craftsmanship, real-world functionality and overall vehicle presentation. From this field, one truck/SUV and one Jeep were chosen as finalists competing to be awarded as the most authentic off-road-capable vehicle at the 2017 SEMA Show. The Jeepster Commando will receive a professional photo shoot and a cover feature and multi-page vehicle spotlight in ORA Magazine. Additionally, the vehicle will be recognized across the spectrum of Transamerican social media and digital channels, an invitation to be displayed in feature locations at TAP-sponsored events, tradeshows, Truck & Jeep Fests, along with the benefits of extensive partner media coverage of the award. The semi-finalists will also be included in the full media campaign and receive ribbons in recognition of their accomplishment. About Transamerican Auto Parts: Transamerican Auto Parts is the world’s leading manufacturer, wholesaler, and retailer of aftermarket parts and accessories for trucks, Jeeps, SUVs and four wheel drive vehicles. Transamerican operations are comprised of 84 4 Wheel Parts retail locations in North America, Transamerican Wholesale sales and distribution, Dealer Services International and the Transamerican Manufacturing Group which includes Smittybilt, Rubicon Express, G2 Axle & Gear, Pro Comp, LRG Wheels and Poison Spyder. We Sell It. We Own It. We Live It. For more information about Transamerican Auto Parts, Dealer Services International and Transamerican Manufacturing Group, please visit: transamericanautoparts.com.